John Armstrong reveals the details of how money orders were processed in 1963 by the United States Postal Service in order to furnish a backdrop for demonstrating the alleged ordering of the Mannlicher Carcano by Oswald could not have occurred as the Warren Commission and FBI claim. Postal money orders have traditionally been manufactured at a printing facility in Washington, DC. On July 1, 1951 the post office announced the introduction of a new style money order (blue tinted color), to be issued on tabulating (punch) cards that can be processed by electronic machinery. During production the new money orders were imprinted with sequential serial numbers and rows of punched rectangular holes (Hollerith computer code) that identified the serial number. With the computer-coded punch holes the new money orders could be sorted with electronic machinery and, according to the post office, handled "like checks." After being deposited or redeeemed for cash at a bank or post office, these "pre-punched" money orders were sent to a Federal Reserve Bank (or Branches) and then sent (returned) to one of 12 postal accounting offices throughout the US. Special punch-proof machines were developed and installed at each of the 12 Federal Reserve Banks and branches for handling the new money orders. Researchers should remember that during the 1950's and early 1960's (prior to April, 1962) the only punched holes that appeared on postal money orders, at the time of purchase, were those that identified the serial number of the money order (by computer code). After a postal money order (or check, bank draft, etc.) was deposited to a bank, it was date stamped by the bank and credited to the customer's account. The endorsed money order (check, draft, etc. ), stamped with the bank's ABA number, was then sent to a Federal Reserve Bank (or Branch) within the deposit bank's district. All postal money orders had to be date stamped/endorsed by the bank receiving the deposit. Without the endorsement, the Federal Reserve would have no way of knowing to which bank the money order was to be credited. At the Federal Reserve Bank a second set of punched holes was stamped into each Postal Money order. In one operation the new machines (IBM 808 proof machines) would list the amount of the money order on paper tapes, punch (by machine code) the ink-printed/stamped amount paid for the money order as shown on the front side, and automatically sort the money orders according to the twelve Post Office regional accounting offices. 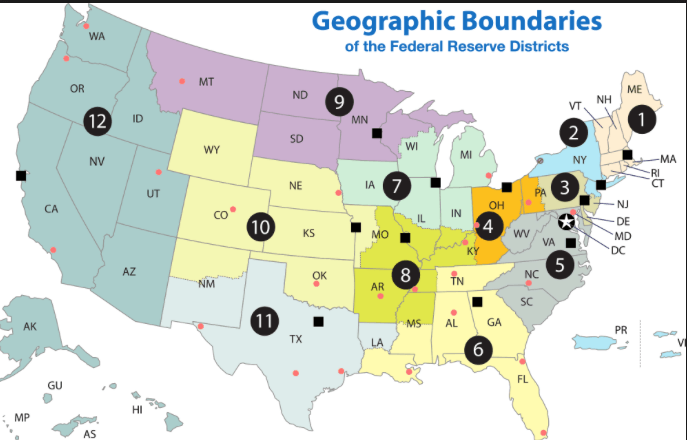 After crediting each bank within their district for the money orders presented, the Federal Reserve bank returned the money order(s) to the regional postal accounting office (there were 12 offices nationwide). 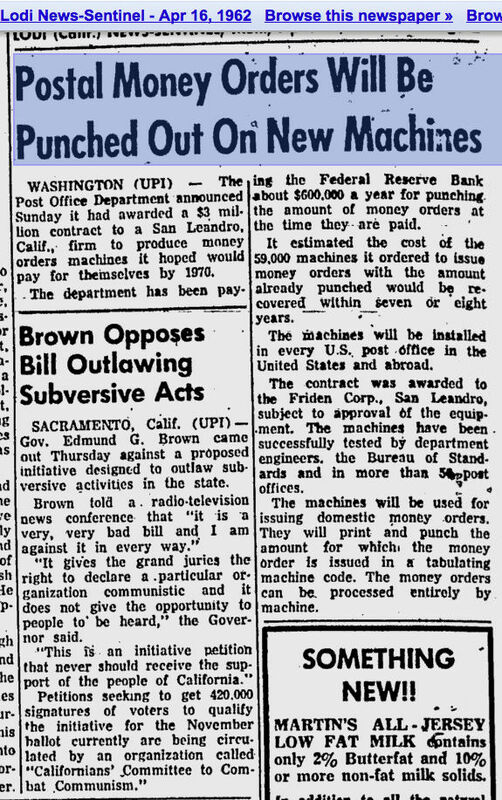 For this service (machine punching all US Postal Money orders), the Postal Department paid the Federal Reserve banks $600,000 yearly. identify the monetary amount of each money order. Money orders, like checks, are routed thru the federal banking system by first depositing them to a financial institution (bank, savings and loan, credit union, etc.). The depositing bank "validates" money orders by date stamping the item for deposit to a customer's account, and then imprints the bank's name and A.B.A. routing number on the back side. (This imprint was required on both sides for a period of time, including the 1960s.) "Validated" money orders are then sent to regional Federal Reserve Banks (12 districts throughout the US) where they are processed. 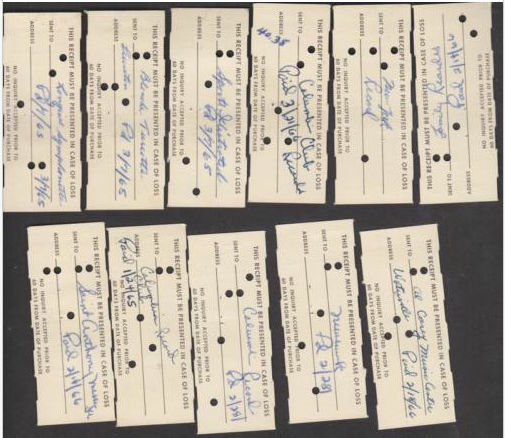 During the punch-card era, they were punched/read to identify the amount of the money order. Postal money orders and checks may have to be sent to more than one Federal Reserve Bank (FRB) for clearing. A postal money order (or check) sent to a regional FRB is often forwarded to a FRB in a different region. For example, if a postal money order was purchased in Dallas, TX (circa 1963) and sent to a merchant in Chicago, it could be deposited to the First National Bank of Chicago (FNBC). The FNBC would endorse and stamp the money order and then send it to the FRB of Chicago (see #7 below) where it would again be stamped. In 1963 the postal money order would then be sent to the FRB of Richmond (see #5 below), where it would again be stamped, and then be returned to the postal accounting office in Washington, DC. The FRB system "clears" a postal money order by debiting the amount shown on the money order from the account of the US Treasurer, and simultaneously crediting the sending bank, identified by the A.B.A. number stamped on the money order. 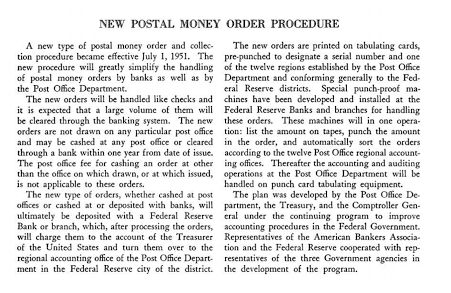 After "clearing," the FRB sends the money orders to a postal accounting office (prior to 1955 there were twelve regional postal accounting offices). 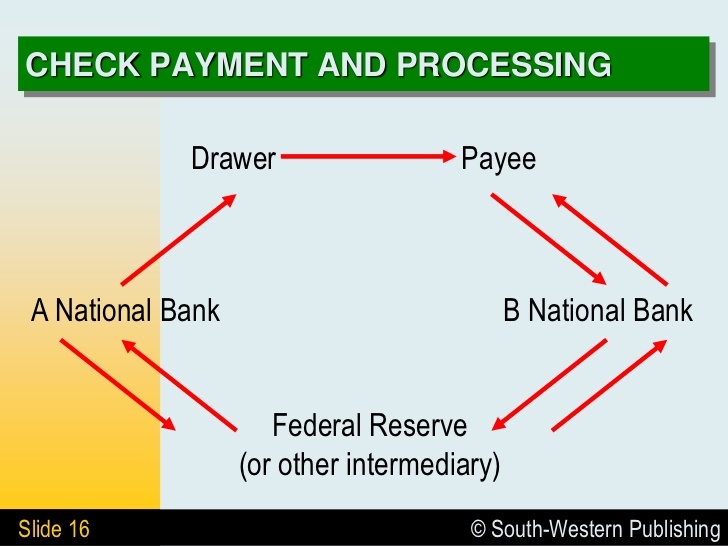 The flow of a money order, or check, can be seen in the following diagram. In the case of postal money orders, the U.S. Treasury is National Bank A in this diagram. The Drawer is an individual or entity with a bank account. In our example the Drawer is the US Post Office which sells postal money orders against their account with the US Treasury. Oswald, who did not have a bank account, allegedly purchased a postal money order from the Dallas post office; the Payee is Klein's, who allegedly received the postal money order in payment for a rifle; the postal money order is then deposited into bank "B" (FNB of Chicago) and is "validated"; the postal money order is then sent to the Federal Reserve Bank of Chicago for "clearing" (and forwarded to the FRB of Richmond). The FRB debits the account of "A," the US Treasury (Postal Department), and simultaneously credits bank "B" (FNB Chicago) for the amount of the postal money order. The FRB then returns the "cleared" money order to the postal accounting office (Washington, DC). The "clearing" process is dependent upon each bank "validating" items of deposit (checks, money orders, drafts, etc.) with their ABA routing number on the front and back side of each item. Without an ABA routing number, a Federal Reserve Bank is unable to issue credit for the item, and the item will not "clear" their system. This is really a very simple procedure. The Federal Reserve Bank (FRB) acts as a "middle man" and simply takes money from bank "A" and gives it to bank "B." To accomplish this with hundreds of thousands of money orders/checks daily, it is absolutely essential that checks and money orders be accurately "validated" by the depositing bank. Validation occurs first when the check is presented for deposit and endorsed by the bank (banks name and date imprinted on the check or money order and on the customer's deposit receipt). Validation is complete when the depositing bank prints/stamps their name and A.B.A. (American Bankers Association) on each and every check or money order. The validated check or money order is sent to the FRB, where it is "cleared" by crediting the depositing bank ("B") according to the ABA number stamped/printed on the money order or check, and simultaneously debiting the bank on which the check was drawn or, in the case of a postal money order, the US Treasurer/Postal Dept. Prior to 1955 there were twelve regional postal accounting offices. 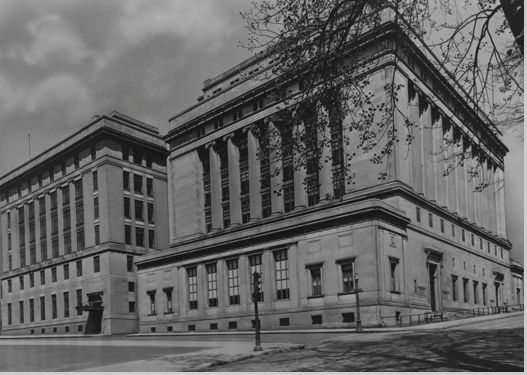 In 1955 these accounting offices were replaced with a new postal facility in Kansas City, Missouri. The new facility, complete with automated sorting machines, was designed to receive all postal money orders, nationwide, directly from all 12 Federal Reserve Banks and Branches. 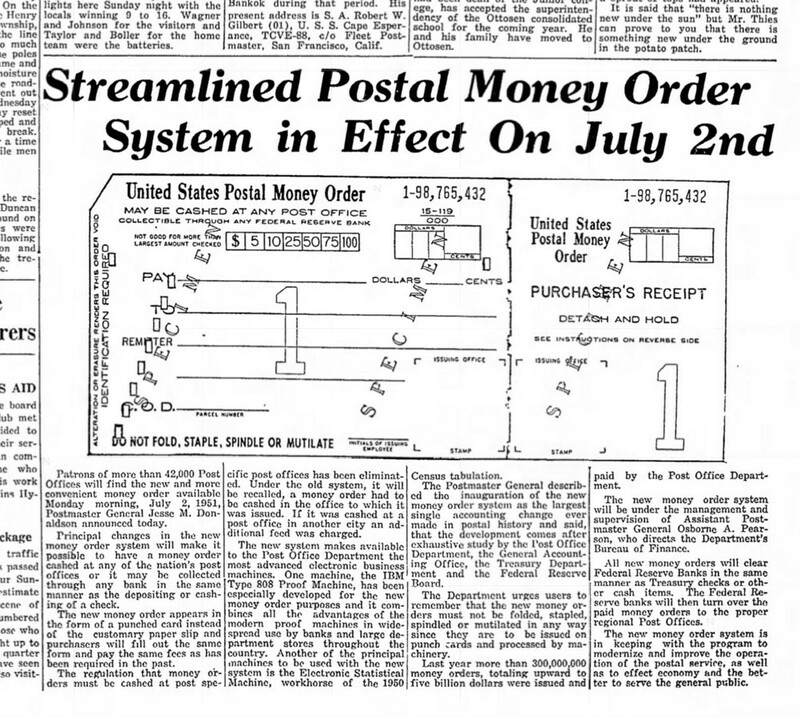 The pre-punched computer-coded holes in each money order made it possible for large volumes of money orders (in 1955, 1.5 million per day) to be electronically sorted and arranged in a systematic way after being returned to a US Postal repository by Federal Reserve Banks. In April, 1962 the Post Office announced that it had awarded a contract for the purchase of 59,000 business machines to the Friden Corporation, of San Leandro, CA. The new machines, to be installed in every US Post Office nationwide, allowed postal clerks to simultaneously ink-print and punch the amount of purchase on each money order with 5 rows of holes (Hollerith computer code). 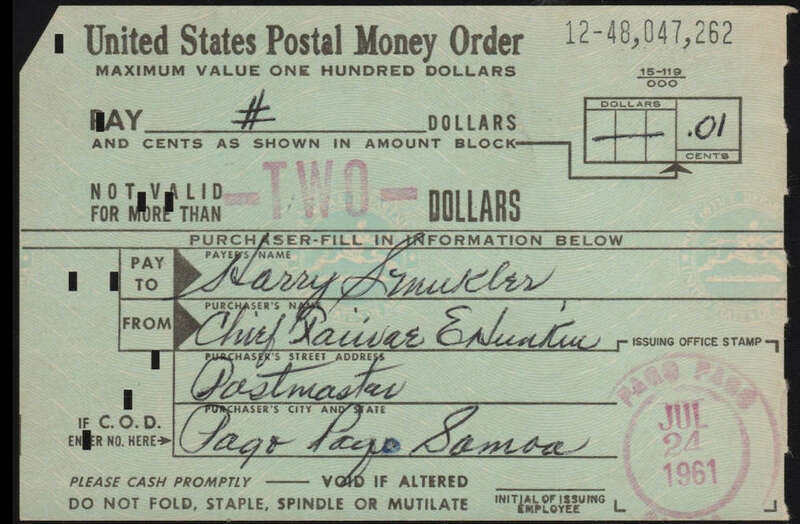 The 5 rows of round holes were punched simultaneously on the money order, a receipt stub for the purchaser and a receipt stub for the post office. In June, 1962 the new machines, and new yellow-tinted money orders, were tried out in 9 states (Florida, Georgia, North Carolina, South Carolina--all in the Atlanta Postal Region; and 5 states in the Denver Region). 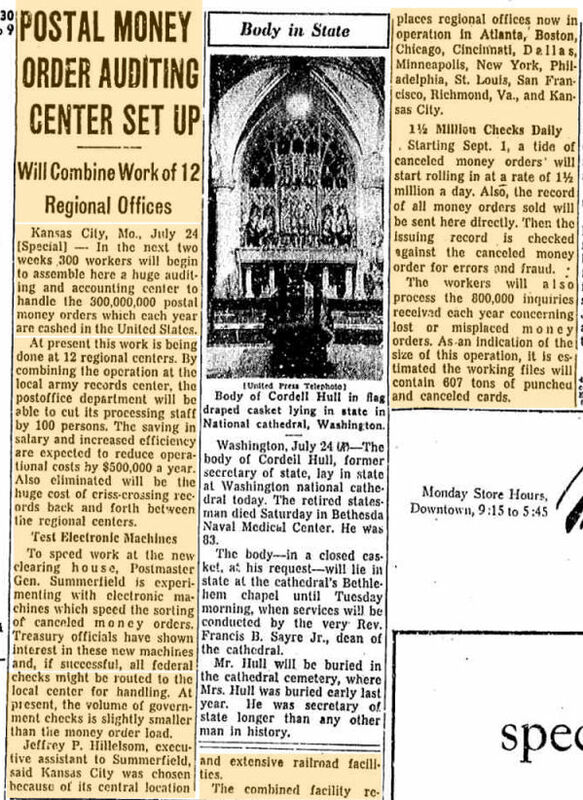 On November 29, 1962, a postal bulletin advised, "Money orders issued on yellow forms are audited at Washington, DC, rather than the Money Order Center at Kansas City, MO." On January 5, 1963 the blue-tinted money orders were discontinued and replaced by light yellow-tinted money orders. Serial numbers on the new money orders, like the former blue-tinted money orders, were pre-printed/ink-stamped (front side) and computer coded with rectangular holes when manufactured. But the round set of computer-coded holes, representing the amount and formerly "punched" by Federal Reserve Banks, were now punched with the new machines at post offices. 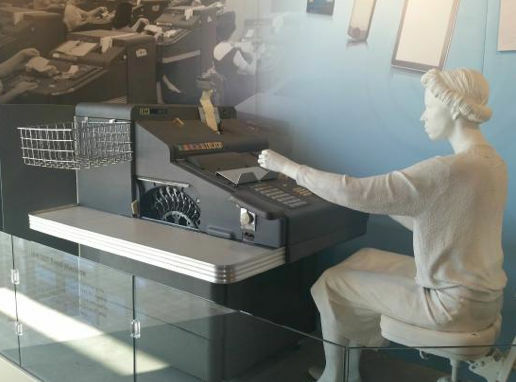 Postal clerks used the new machines to simultaneously ink-stamp and punch-code the money orders when they were purchased by customers. The General Post Office (GPO) in Dallas received a batch of the new yellow-tinted money orders on January 5, 1963, probably beginning with serial # 2,202,000,000 (see below). John Armstrong began investigating Lee Harvey Oswald in the early 1990s, uncovering a plethora of discrepancies concerning Oswald's height, weight, eye color, scars, medical records, school records, military records, and photographs, as well as indications that the FBI suppressed, ignored, fabricated, altered, and destroyed evidence. After delivering lectures at conferences throughout the 90s, he published his findings as Harvey and Lee. The research materials for the book were given to Baylor University, which has made digital scans available; see also his website.